Georgia would become another place without wine, as it is known by everyone. However, sheep makes Georgia a bit special and similar to what we have known about this country. At the beginning of autumn and at the end of each spring thousands of farmers gather ‘harvest’ which is not less valuable that one collected by vignerons, particularly, wool. My name is Irena Timotievich, I have travelled along Georgia, and in this article I would like to tell you how and why they do it. We were accepted as if we had been long-standing friends who had been a long time coming to the table. In a minute from the heaping of sheepskin the fifteen-liter can with home-made wine, and on my drooping shoulders I felt an overcoat while in the arms I got a plate with the freshly cooked mutton. The guest is the envoy of God, Georgians are assured. So, it means to offend a person in case one does not want to taste delicacies. We encountered this shepherd camp on the way to the village Stepantsminda. We noticed it following the wooden fold where the season sheepshearing was going. Three shearers so quickly and flexibly managed scissors that it seemed that they drew Georgian patterns but not sheared off wool. The bonfire was burning, while the dinner was being preparing. Its smells from time to time chased noses of dogs that observed the process in a tired way. One of the dogs noticed us teeth bared with hostility. ‘Be quiet, Barhan’, the man of average age with the reddish face smiled and lovely tapped Anatolian Shepherd on the body side. Making the typical arm gesture, people invited us to sit near the bonfire. In such a way, we have got familiar with Irakli, the owner of flock. ‘It is an amazing shepherd, attentive to details, strict, loyal’, Irakli appraised the dog throwing the bone. – ‘However, he is not able to follow three thousand sheep of mine alone. That is why I have thirty dogs’, he boasted in an odd moment, and called to have a dinner one of the shearers who had been going on working all this time. For a moment it seemed for me that in the eyes of white lambs the black envy flashed. Before the sheep shearing they are not fed and given with drinks at least for twelve-fourteen hours because on a full stomach they extremely badly endure the process. The sheep shearer called Vano did not tend to ceremonies and with the rustle slipped off a slice of thick Georgian lavash, emptied a glass of wine at one gulp and with relish smelled his sleeve. Perhaps, he also had been waiting for this moment for a long time. ‘They have a lot of work now, time presses, - as if confessing, the owner said. – we had been waiting for the warm weather for a while but we saw only rains and rains. Yet, the wet wool is the spoilt good’. In the collection of qualitative raw material it is important to match not only climatic conditions but also promptness. 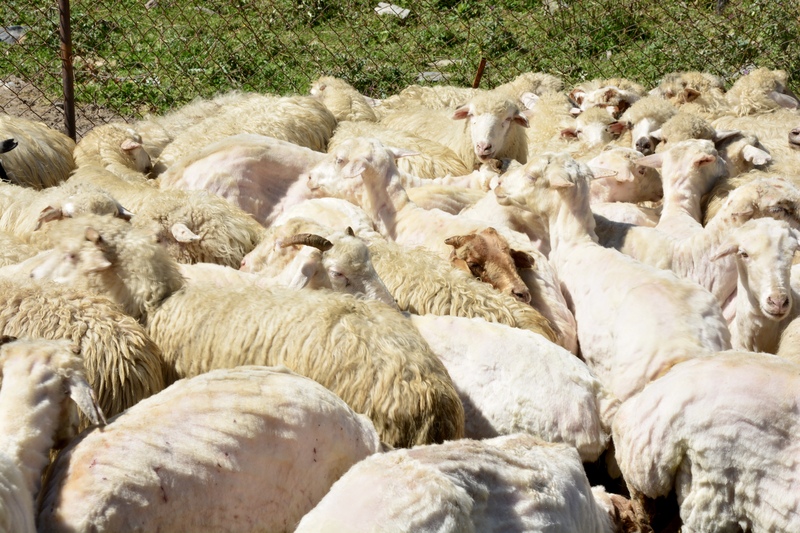 If one gets late in the spring, one may lose up to 50% of shearings because animals start casting the coat by summer. If it happens in autumn, they get cold because in the first weeks after shearings they are extremely vulnerable. Suddenly Vano smirked cunningly, brought me the huge scissors and gave a nod to the ship that was humbly lying as if saying: try to do something with it. Here it became clear for that if I were a shearer I would be known as the most ham-handed person in the world. The most terrible thing is to hurt animal by accident. That is why I ignorantly cut almost half from what was necessary. Vano only cheerfully tapped on the should and continued working alone. He had an amazing twist of the wrist as fleece is straight and well-rounded, while sheep are calm, pleased, and bald. He is able to shear up to thirty-five heads. He works quickly and concisely, throwing immediately dirty or spoilt wool while sorting the rest upon the length, color, and thickness. The main thing, he makes everything smiling either receiving pleasure from the process or because as if it is sounded in the song ‘if you have drunk and got sad, you are not a man, you are not a Georgian’. In these lands Irakli could be considered as truly well-off person. He has not chosen the lifetime project as it came to him from the father while the father got it from the grandpa. Nevertheless, the true pride overfills him from the fact that he succeeded being though little yet a part of ten-thousand-year-old history of sheep breeding. Particularly, so many years ago, according to the suggestions of scientists, in the Central Asia there the first heart of sheep domestication happened. Now it is not only the leading area of animal breeding of Eastern Georgia. The cattle here is inevitable part of national features such as wine, khachapuri, moustache, ‘wah-wah-wah’, or ‘let’s go to the restaurant and dance’. Slow walks of the flocks with the surfaced portion of the highway under the accompaniment of intrusive honking of the cars and nervous grumbling of the drivers represent quite a typical picture here. Georgia would not be itself without sheep. According to the legends, in the antique times country Kolhida, the modern territory of Georgia was famous for its gold-containing rivers. So as to get the precious metal, the gold miners used sheepskins. It is the source of the legend about the Golden Fleece while the image of lamb became the symbol of sacrifice, good, and prosperity. All the festive tables of self-respecting Georgian should contain dishes made from the lamb as well as cheese. ‘If you do not have a cheese at home, it means you are dead’, as it is stated among people. You will never forget the smells and tastes of the true chakapuli (‘meat in foam’) in case you have tried at least once this gentle lamb meat in greens and species, or mountain cheese from sheep milk gudiskveli (‘cheese from the bag’). Any wardrobe cannot stay without sheepskin coat, not to mention national headwears the majority of which are hushcloth or woolen. Though (it is place for jokes) Georgians wear hat not only for the warmth but also for respect. Moreover, all the traditional houses are known for pardaga. These eye-catching woolen carpets with the patterns earlier almost have not been weaved for sale, only for personal usage. The floors were warmed with them, the same happened with tahta (a kind of sofa); they also could be put on the wall. In the colorful palette and patterns, similar to Ukrainian rushnik there are ancient traditions of ethnos, its worldview and lifestyle. For the centuries the highlanders had been searching for the breed of sheep able to satisfy all their needs at once. Not finding, they started breeding them by themselves. The most popular is broad-tailed sheep which Irakli has. Collecting the genes of indigenous species, it may boast of the high quality of the meat and gentle substance of milk as well as long wool with good shearing, from three to five kilos from one individual. The majority of this ‘harvest’ will be exported to us, to Ukraine, and bags hideously filled with raw material will transform into the colorful coats, loosing undercoats, carpet in living rooms or fashionable bags in the shops. ‘Three. – Irakli shows onto his fingers. – Three dollars are for one kilo of wool. It is like the cost of two little churchhela (Georgian national delicacy) at our market’. Everything depends on the point of view if one considers this amount as big or little. Big taxes, huge rivalry, lack of pasture seem to be only a little share of difficulties what now local sheep breeders encounter. However, there is some hope for better. At least, this year Georgian lambs will be going to European markets. Certainly, Georgians do not have to gather gold with fleece neither in a direct nor in metaphorical sense. Yet, I am assured that until sheepskin overcoat, the legend is continuing. Tbilisi is a city that does not leave anyone indifferent. It is depictured by a talented photographer Pavel Khomenskyi and published in theoutlook.com.ua edition . While browsing the photos, you will take a sightseeing tour of one of the most beautiful capitals in the world. From open windows you can smell khachapuri, from restaurants you can hear men singing many voices, you can notice how modern buildings from the future fit perfectly into the old landscapes - and all of this heppens in Tbilisi. You will not avoid colours of the city! Enjoy the photo, open the flight schedule for May and feel free to buy a ticket for a spring trip to the city, where you are always welcome, make hundreds of wonderful photos, and perhaps next time we will post your cards from Tbilisi! Young Ukrainian writer Pavel Khomenskyi visited Batumi, the city smothered in greenery and shining bright, the one that local citizens call the city of love. Palm trees, cypresses, magnolias, oleanders, bamboos, laurels, orange trees, thujas and box trees exhale fragrances on every step there; they tempt you to go watch a romantic picture of ships sailing off harbors. And today the author shares with you his postcards from this amazing city, penetrated with murmur of the sea and taste of fragrant wine. Today we invite you to join our trip to the resort part of Georgia, to vicinity of the beautiful and cosy Borjomi town, the birthplace of the legendary Borjomi mineral water. One of the most popular and healthy mineral waters of the world, has been bottled here for several centuries. In Gudauri it is easy to feel time, pinch it between your fingers and stretch it in space, tuning up your inner rhythm to a sensation mode. There are no deadlines, annoying neighbours and reckless guys driving out to oncoming traffic lane. All this hustle and bustle seem illusory and momentary. Here, in Gudauri values are different. The mountains do not tolerate fuss, inner dialogue and self-criticism. The greatest pleasure is just to contemplate at them. MUST-WATCH VIDEO: And some tea to Room 13, please! This beverage became so deeply ingrained in the life of humans that we sometimes even fail to notice putting a kettle on a stove. There are thousands ways of best-loved beverage brewing in the world. OUTLOOK offers the best of them to your attention. Gela Dumbadze commenced the duties of the Head of diplomatic mission of Georgia to Ukraine and gave the copies of credentials to the deputy minister of foreign affairs of Ukraine on the issues of European integration Elena Zerkal. On 10-13 May, the International scientific conference “Ukraine and Georgia: diplomatic relations, international ties, cultural diplomacy” dedicated to the 25th anniversary of the establishment of the Ukrainian-Georgian diplomatic relations at the current stage of our countries’ development took place in Batumi. Iliko, who devoted all his life to dancing, actually bequeathed to his descendants to do everything possible for his family name remained on posters forever. 70 years later, millions of people in hundreds of countries are buying tickets where in different languages, without translation one can easily read the name of Sukhishvili. The Ambassador Extraordinary and Plenipotentiary of Georgia to Ukraine Michael Ukleba arranged a welcome reception in honor of the 25-th anniversary of the country. The mission to congratulate the Head of diplomatic mission for the main national holiday was implemented by the Minister of Foreign Affairs of Ukraine Pavel Klimkin, the President of Ukraine (1991-1994) Leonid Kravchuk, as well as the ambassadors extraordinary and plenipotentiary of the foreign states. On the 20-th of May in Central Officers’ House of Armed Forces of Kiev there was a Festival of Georgian culture dedicated to the 20-th anniversary of creation of Georgian expat community in Ukraine and 25-th anniversary of Independence of Georgia. On December 10 in Tbilisi, the capital of Georgia, awards ceremony of ADAMI Media Prize for Cultural Diversity in Eastern Europe took place. Online media about the world theoutlook.com.ua made it to TOP-3 best web pages covering cultural diversity issue in the region. Georgia is a state that has such a distinctive color that uncommon facts, previously unknown to general public are so asking to be added to treasury of knowledge about this country. We can’t but put there attitude of citizens towards corruption that take the word “transparency” literally. Or top our collection up with architecture metamorphoses of the country that create stark contrast with soviet heritage. We decided to open our “Georgian” treasury and share most precious items from it. Outlook suggests you have a walk around one of the oldest districts of Tbilisi - Avlabari - that has been believed to be Armenian since down the ages. 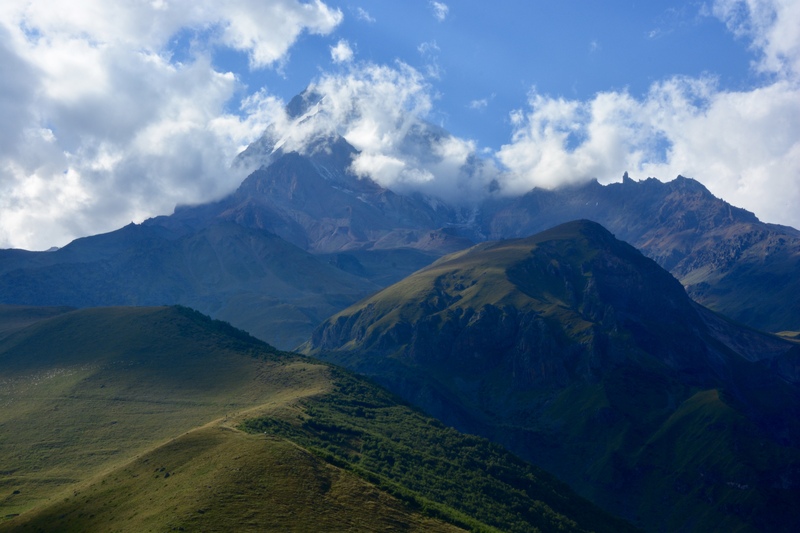 These streets, churches and weatherbeaten houses will tell about relations of these two peoples of Caucasus much more than books in history or documentaries. What season can be better than warm months to conquer summits, overcome seas and climb on the rocks? People often make great efforts to enjoy the comfort through the whole lifetime. But sometimes our soul needs some romance, so OUTLOOK presents seven unique canyons. Yesterday on May 26 in Kiev was held a gala diplomatic reception organized by the Embassy of Georgia in Ukraine in honour of the main state holiday - the Independence Day.